Indonesia has around 187 million registered voters scattered across 13,500 islands, 3,200 miles of sea and land, and three time zones. On July 9th, for just the third time in the country’s history, those widely dispersed voters directly chose their president. As you might imagine, voter fraud is a major concern in the world’s largest single-day election, in a country where the average annual income is less than $1,500. So how to keep an eye on the 480,000+ polling stations? Use the wisdom of the crowd! C1 Yanganeh is a Tumblr to track suspect official Election Commission C1 documents from each polling station. Election offices at polling stations use the C1 form to record results, which are then sent to election officials at the village level, where they are totted up and written on another form. 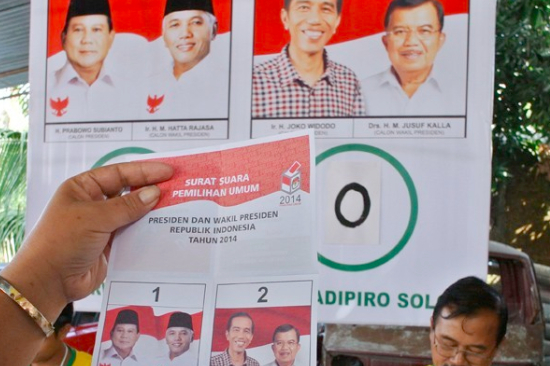 Kawal Suara takes C1 review the next step by letting Indonesian users manually input counting results by reading random C1 documents one by one, and limits each IP address to only inputing one document from each voting booth. Kawal Suara was developed entirely by Reza Lesmana, who already has 1,200 users who “crowdcounted” over 31,000 documents. MataMassa is a Ushahidi-based website that allows the public to submit allegations of electoral fraud via SMS, web, or mobile device. It doesn’t focus on C1 documents, but the overall voting process and has found over 300 instances of verified vote fraud. MataMassa was developed by iLab and the Jakarta branch of the Alliance of Independent Journalists. These three applications are no substitute for clean and fair elections, but they are 3 great first steps towards electronic transparency and digital accountability in Indonesian democracy.